The FlexCare name has a few variations that span from the most basic FlexCare, and FlexCare Plus to the Bluetooth enabled FlexCare Platinum Connected. We’re going to take a look at all of them and lay out the differences so you can make the best decision. At this time there are no “current” models from the FlexCare Platinum line listed on the Philips Sonicare product page. They are still supported by Philips and are likely being phased out in favor of newer models. They are still a great buy and have the same brush speed as the new models. We’ve included a FlexCare Platinum model in our comparison table below just in case you’re interested. Aside from the slower speed, which is still impressive, there’s no significant difference, and actually, they have one of the longest battery runtimes of any Sonicare model. Also, keep in mind that a few of the FlexCare models come with a pair of brush handles. That means you get 2 individual toothbrushes in the box. One quick note about the brush speed specification. Philips started using the term “brush movements per minute” instead of “strokes per minute”, which seems to just be an excuse to double the number that they show for the brush speed. Just keep in mind that the 31,000 strokes per minute numbers are equivalent to the 62,000 brush movements per minute when you look at specifications. All “FlexCare” models do not have Bluetooth Connections for the phone app. As a reminder, these aren’t “current” models but can still use all the Sonicare brush heads. If you find a good deal on these, then don’t pass it up! All “FlexCare Platinum” models have 3 Modes and 3 Intensity settings. 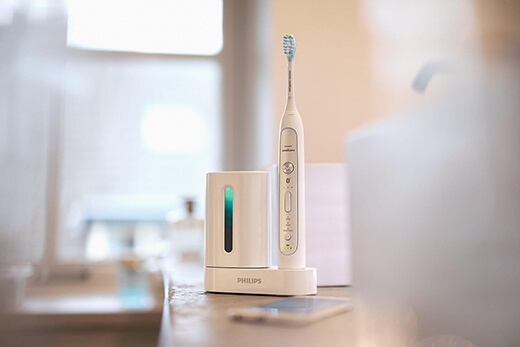 The FlexCare Platinum Connected toothbrushes have Bluetooth capabilities which allow them to sync with your phone and make use of the iOS/Android Sonicare App. The app keeps track of where you’ve brushed, how often you brush and suggests areas you might have missed. As you can see there are a ton of FlexCare models available with a range of features and accessories. If you’re interested in the app and want to see what it’s all about, check out that section below. Next we’re going to take a more in-depth look at the most popular models from each FlexCare category. Then we will look at the UV Sanitizer and Sonicare Phone App, as they are features that are unique to the FlexCare and DiamondClean Series. First, here’s a comparison table of the currently popular models from each category. If you like to be able to vary the intensity of your brush then you should consider the FlexCare Platinum or FlexCare Platinum Connected. You get a variety of modes with all the FlexCare models, but you can’t change the intensity of each mode on the FlexCare and FlexCare+. Now, the FlexCare and FlexCare+ do have the “Sensitive” mode, which does give you reduced speed, however you can’t change the intensity of any of the other modes. The difference is that the FlexCare Platinum and Connected models give you 3 intensity settings in each mode, not just a single slower mode. As we mentioned before, some of the FlexCare models come in packs of 2. They are a great deal and are fully featured. This only applies to the standard FlexCare models and not the FlexCare Connected. If you have no interest in the Sonicare Phone App, then you can almost get 2 toothbrushes for the price of one. Pressure Feedback works a little differently on each model, but it vibrates the handle or lights up the ring around the neck of the handle near the brush head. Not all models have the light up feature. The Smartimer is a 2-minute timer which lets you know when to stop brushing. Two minutes is the recommended brushing session, and this feature is enhanced by the Quadpacer, which helps make sure you spend equal time in each part of your mouth. Philips designed the Quadpacer to alert you every 30 seconds to switch to a different section of your teeth, which means there are 4 sections total. 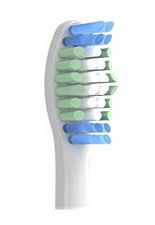 Majority of the Sonicare brushes have the Quadpacer feature, but they have also introduced the BrushPacer in the FlexCare Connected and DiamondClean Smart models. The BrushPacer alerts you every 20 seconds, which means your teeth are divided into 6 sections. This seems like splitting hairs, but it’s intended to help you not miss certain areas of your mouth. It’s also likely this helps their app recognize where you’re brushing in your mouth. The Easy-Start feature is ubiquitous across the Sonicare toothbrushes. Its purpose is to make the transition from manual to electric toothbrushes smoother by initially reducing the speed of the brush and slowly increasing it as you use it. Formerly, the increase occurred over 12 brushing sessions, but the more recent models have switched to 14 brushing sessions. To advance through the Easy-Start phases, you must brush for at least 1 minute each session. These are the core features that the FlexCare series has, and that you’ll want to keep in mind if you’re looking at other Sonicare toothbrushes. Accessories are also important to consider when choosing which FlexCare model you want to buy. The travel cases are all very similar, but a few models come with a charging travel case, which means you can leave the brush handle in the case and have it charge. Very convenient. The cord is USB, and you also get an adapter for plugging it into a typical 110V outlet. There is also a travel case that looks just like the charging one but doesn’t have charging abilities. Similar to that is the travel case that has a transparent body and functions identical to the regular travel case. If you don’t get the charging travel case, your toothbrush will come with a compact charger or deluxe charger with a UV Sanitizer. Disinfection by UV light is a commonly used method to kill or inactivate microorganisms in applications such as food, air, and water purification. Many microorganisms are susceptible to UV-C light, which is the type emitted by the Sonicare Sanitizer. The cleaning procedure with the Sonicare Sanitizer lasts 10 minutes. Dust and any residue covering the UV light will reduce its effectiveness, so be sure it stays as clean as possible. Its effectiveness depends on line-of-sight with the organism and its ability to withstand UV radiation. You can sanitize 2 brush heads at once with the Sonicare UV Sanitizer. You should also be washing your brush heads, as usual. Don’t just rely on the UV sanitizer. Many people are interested in the Sonicare FlexCare Whitening Edition, which comes in a few different forms. We’re going to look at the top 2 models in this Series. What the difference between the Whitening Edition and other FlexCare brushes? Not much. The majority of FlexCare models include a “White” mode, but even then it’s not clear what exactly is more “whitening” about that particular mode. It would be nice to see a clinical study outlining the difference, but that doesn’t seem to exist. (If you’re aware of such a thing, please leave a comment below.) The brush heads aren’t any different as they are usually just the standard DiamondClean or Plaque Control brushes. With that said, the Whitening Edition brushes we’re going to show here come in packs of 2. That means you get 2 toothbrushes for the price of one. Not a bad deal. For the HX6962/73 edition, you may have noticed there are 2 routines in addition to the 3 brush modes. This is a slightly different implementation of the Smartimer feature. The GoCare routine is a quick 1-minute brushing timer intended for touch-ups between regular brushing sessions. Maybe you like to brush after eating lunch? This is a fast timer that serves that purpose. The MaxCare routine is a 3-minute brushing timer for thorough cleaning. This routine setup seems to be unique to this particular model but may exist on older models. The regular Smartimer routine lasts 2 minutes. Overall, these are a great deal with the charging travel case and two brush handles. They may not be the latest and greatest, but they don’t lack any significant features. Below are some screenshots from the introduction to the app. This covers most of the features you’ll see with the FlexCare Platinum Connected toothbrushes. The one feature that differs between the DiamondClean series and the FlexCare series is the BrushSync feature. While the BrushSync feature is available on both types of handles, the DiamondClean can switch to different brush modes automatically depending on which Smart brush head you attach. Also, the non-Smart brush heads aren’t able to be tracked by the app in the same level of detail as the Smart versions. The FlexCare Series is capable of using any of the Sonicare brush heads, aside from the E-Series. You have tons of choices and the ones we’ve linked below are the non-Smart versions. The FlexCare Series comes with a Lithium-Ion battery and gets a respectable 2 to 3 weeks of run time, depending on your model. As you’ve already seen, there are a few different chargers available with the most convenient being the Charging Travel Case. The UV Sanitizer is built into the charger for the models that it comes with, but they also come with the Compact Charger. We like to recommend not leaving your brush handle on the charger while it’s completely charged. There doesn’t seem to be any adverse effects with the Sonicare toothbrushes, but this can lead to problems with some electronics that don’t have a quality charger. This is especially true if you have NiMH batteries instead of Lithium-Ion. Q: Do the 2-Packs of handles come as different colors to identify them? A: No, you won’t be able to tell the handles apart unless you mark them yourself. The brush heads do come with different symbols or colors on them to distinguish them. Q: Can these be used in the shower? A: There are some reports of water leaking into the handle and causing failure, though this seems rare. It’s best to be cautious and not tempt physics. Q: How long does it take to charge the battery? A: When you first receive the toothbrush you need to charge it a full 24 hours before using it. After that, it’s fast and depends on how far you’ve let it drain. Charging it once a week is a good plan. Q: How many brush heads does the UV Sanitizer disinfect at once? Q: How does the Quadpacer signal you to switch to the next quadrant? A: It briefly stop the brush for less than a second, beeps, and restarts. Q: What is a good way to clean my brush head without if I don’t have the UV Sanitizer? A: Hydrogen Peroxide or Isopropyl Alcohol are effective. All the FlexCare models have global voltage compatibility as long as your outlet doesn’t go over 220V. For portability purposes, you should stick with the models that come with the Charging Travel Case and avoid the UV Sanitizer as it makes the charger much bulkier. If you’re looking for something more basic than what you see with the FlexCare models, then check out our review of the ProtectiveClean Series. As you’ve seen there are a lot of options in the FlexCare Series. We think getting a 2-Pack bundle is the best bang for your buck. The UV Sanitizer is unnecessary and adds too much bulk to the charger. We also find the app to be unnecessary, but some people like the accountability. If you have the Smart brush heads, then it does indeed become more useful to track precisely how the brush head has been used.